James London Welham was born 20/9/1847 at Newcastle, N.S.W and died 2/7/1927 at Wickham, N.S.W. He married Charlotte Ann Royston on 19/5/1870 and they had 8 children. J. Welham Newcastle, N.S.W. won Tattersals sweepstake of 1000 pounds on the Melbourne Cup in 1903. Mary Ann May Welham b. 17/5/1871 Newcastle, N.S.W. - d. 19/2/1932 Hamilton, N.S.W. married Enoch Elder (born Newcastle, N.S.W. 1869) in 1892 at Hamilton, N.S.W. Walter James Welham b. Sept 1874 Newcastle, N.S.W. – d. 4/4/1878 Railway St, Newcastle, N.S.W. Florence Charlotte Welham b.1876 Newcastle, N.S.W. – d. 1962 N.S.W. Sarah Ann Welham b.19/8/1878 Newcastle, N.S.W. – d. 1933 Taree, N.S.W. Harold William Welham b. 1884 Newcastle, N.S.W. – d. 1958 Islington, N.S.W. Frank Welham b. 1886 Newcastle, N.S.W. - d. 1886 Newcastle, N.S.W. Henry Goodwin Welham b. 1887 Newcastle, N.S.W. d. May 1887 Newcastle, N.S.W. 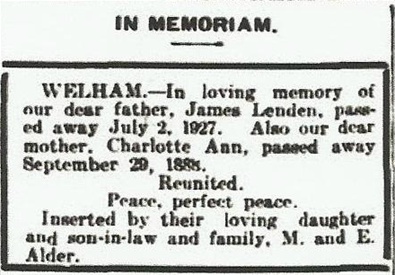 James London Welham - In Memoriam notice - Newcastle Morning Herald 2 July, 1928 - inserted by his daughter Mary Ann May Elder (nee Welham). 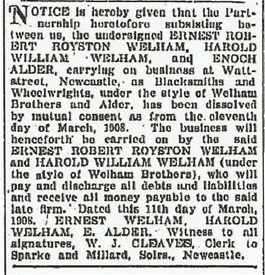 Ernest and Harold Welham and Enoch Elder (husband of Mary Ann May Welham) dissolved their Welham and Elder partnership as Blacksmiths and Wheelwrights in 1908 as reported in the Newcastle Morning Herald and Miners' Advocate newspaper 14th March, 1908. Ernest and Harold Welham then continued on in partnership. 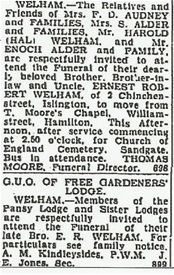 Funeral notice for Ernest Welham, 5th child of James and Charlotte Welham, died January 1953.